Arc Fabrications Ltd are specialists in architectural and structural fabrication. Our company commenced trading in June 1991 and since that time we have had many satisfied customers. Our complete service includes specification, site survey and on-site installation. We understand the importance of working closely with architects and designers to ensure that fabrication requirements are completed within refurbishment or building schedules. We offer a variety of standard designs, or for those requiring bespoke fabrication we can adapt designs to meet individual requirements. All projects are completed to the highest standard approved by Westminster Council, The Metropolitan Police and comply with Health and Safety regulations. We currently hold Public Liability Insurance up to £5 Million. Our team of experienced welders can perform works on-site or alternatively at our premises. Our experienced team will work with architects and engineers to fabricate architectural steel to exact specifications. 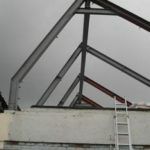 Our steelwork has gone into houses, offices and warehouses. Arc Fabrications custom fabricate structural steel for clients around London. Our products include Rolled Steel Joists (RSJs), angle brackets, steel beams, steel channels and steel bars. 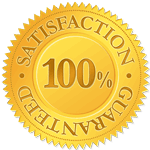 We can provide a complete surveying and quotation service. 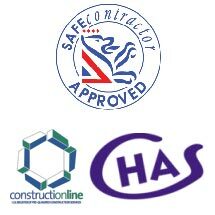 We are members of the Guild of Master Craftsmen as well as being approved by ConstructiOnline, CHAS and SAFEcontractor. 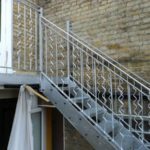 We are your first place to call for steel staircase fabrication in London. Whether you need a staircase indoors or at the exterior of a building, we can design, fabricate and install all types of steel staircases. We manufacture and install spiral staircases, whether a simple design for fire escapes, or ornate and decorative designs for interior use in a home or office. 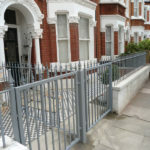 Arc Fabrications have designed, fabricated and installed cast iron railings and steel railings across London and the South-East of England. 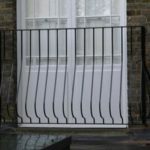 Arc Fabrications provide repair services for wrought iron railings, cast iron railings and steel railings. 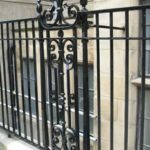 The picture on the left is of railings outside the Land Registry in Lincoln’s Inn, London, where we repaired the railings damaged by a car accident. Wrought iron gates were also fabricated to match the railings which were installed. We can construct and install steel balconies and railings to your exact specification and designs. From fire escapes to garden views, our steel balconies are constructed to the highest standards of safety and construction. Ask us for a free quotation for your bespoke Juliet Balcony construction in London.